Birth at Kheora, a tiny little village in the district of Tripura in East Bengal in the house of the grandmother’s parents. 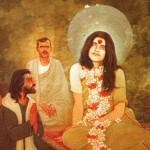 Her parents named her Nirmala Sundari. Worshipped by a divine luminous person while she was a baby of 10 months at her father Sri Bipinbehari Bhattacharya’s place at Vidyakut. Days of her childhood spent in Sultanpur and in Kheora with family friends and neighbours. Primary education at both places at the age of eight or nine. After marriage Ma went to live with the family of Revati Mohan Chakravorty (husband’s elder brother), who was a Railway Station Master. 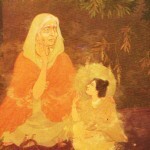 Ma was considered as the deity of prosperity even there. After the demise of Sri Revati Mohan Chakravorty Ma came to live at Astagram where Bholanathji was posted. Seeing her smiling look and blissful mood Ma was given the name “Mother of Bliss” (Kushir Ma) by the wife of Jaysankar Sen. It was prophesied by the brother-in-law of Jaishanker Sen, Harkumar that in future the entire world would call you Mother. While engaged in domestic work Ma used to go into deep absorption. When Bholanathji was transferred to Bajitpur Ma remained at Vidyakut, the residence of her parents for about three years. 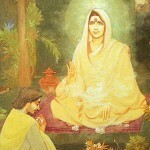 At Bajitpur at the age of 22 manifestation of various spiritual Kriyas occurred. 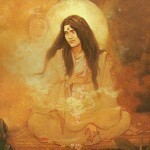 During the midnight of the full moon in August the manifestation of self diksha (initiation). When being asked by the cousin brother. Who are you? The reply emerged from Ma – Purna Brahrma Narayan. 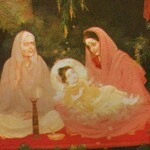 Bholanathji received initiation from Ma. 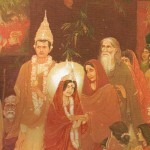 Bholanathji entered the service of the Nawab of Dhaka and arrived at Shahbagh along with Ma. Pran Gopal Mukhopadhyay and Jyotish Chandra Roy (Bhaiji) visited her for the first time.